First of all, before installing and taping dance floors, dance pros always check the floor surface. Then they check for debris, nails, screws and anything with a point or a sharp edge. Finally, they complete the task, unroll the floor and tape it down with dance tape for floors. Most importantly, before taping dance floors let’s talk about the harder task to find the head of a nail that is slowly backing out of a wooden floor. Wood floors expand and contract due to temperature and humidity changes and the force of leaping dancers accelerates the process. Nail heads protrude above the floor surface, work their way out and cause damage before the floor is rolled up again. 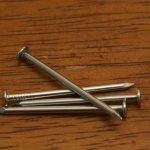 There are several ways to track down those nail heads if you really care about the condition of your floor. Most importantly, inspect the floor closely in good light. Also, use a flashlight to try to find anything shiny. Finally, slide your foot across the floor while wearing socks will give you a better feel, and in some cases, the nail may grab your sock. Finish checking the floor, roll out your vinyl dance floor and secure it with dance tape for floors. For dance floor tape in 3 widths and 11 different colors, including black, white, yellow, red, blue and more, shop TheTapeworks.com. Dance Floor Tape is vinyl tape designed for seaming Marley-style dance floors. Vinyl Dance Floor Tape has a smooth finish and gives a seamless feel to dance floors. Tape for Dance Floors removes easily and cleanly. Six mils thick. Dance Floor Tape has lots of other great uses.